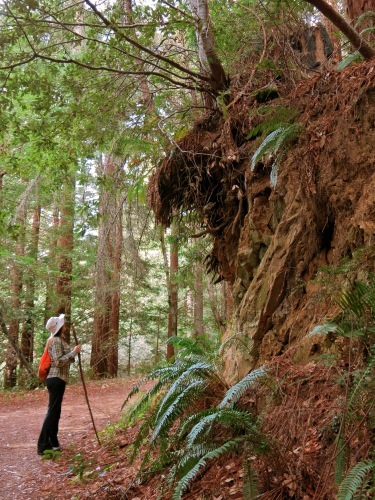 These lichens were growing on reddish soil exposed by a road cut, in the redwood forest above Camp Meeker, California. The lichens in both photos are approximately the same size; in the first photo, the edge of a nickel appears at lower left to provide a sense of scale. 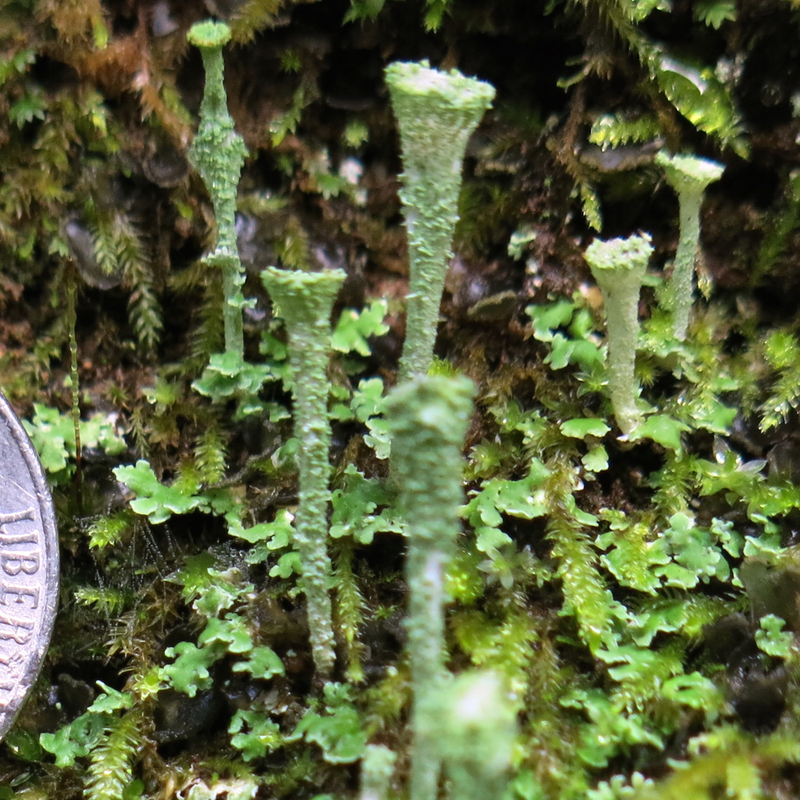 As to identification, these lichens are in the genus Cladonia: the primary thallus consists of whitish-green squamules (the little leaf-like things at the bottom of the organism); and arising from the squamules is the podetium, an upright structure characteristic of the genus Cladonia. 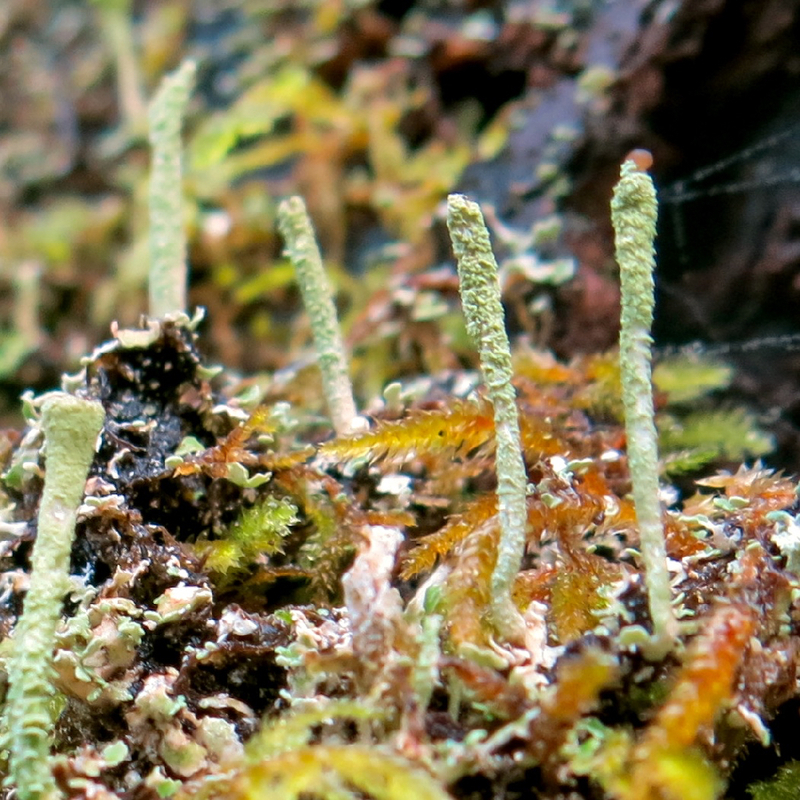 But to determine which species of Cladonia, I would have had to collect some samples and carefully examined them. In Lichens of California, Mason E. Hale Jr. and Mariette Cole state that “Cladonia is one of the first lichens collected by amateurs; since I am a rank amateur when it comes to lichens, it is thus no surprise that I paid so much attention to these showy and fascinating lichens. Author Daniel HarperPosted on January 24, 2018 January 27, 2018 Categories Road tripsTags Coastal Redwood ecosystem, lichenLeave a comment on Lichens, Camp Meeker, Calif.
Carol and I decided to hike up to the top of Bald Knob from the parking lot at Higgins Canyon Road. We climbed steadily through the Coastal Redwoods up into the Douglas Fir forest, and in less than two hours were at the summit of Bald Knob. It was a little disappointing, because Bald Knob wasn’t at all bald, and instead of the views we had hoped for, we just had a Douglas Fir forest. But it was a beautiful Douglas Fir forest, smelling of fir trees and woods, and it was quiet, so we sat down to eat lunch. After lunch, we walked down Irish Ridge Trail, and just a short distance down the trail, there were green grassy slopes sprinkled with wildflowers. 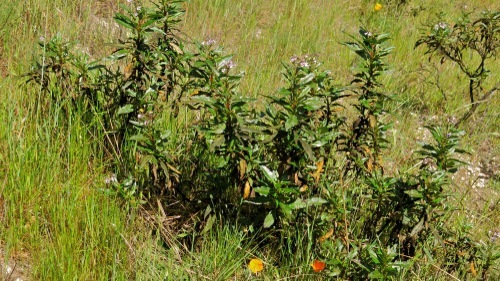 Dad and I used to talk about the way wildflowers sprang up all over the hills of coastal California during the spring; it was one of the things that had most impressed him, I think, in one of his early trips to California. Unfortunately, Dad’s dementia means that that well-worn, familiar conversation is no longer possible, so I took a photograph of some flowers instead — Dad has always taken photographs documenting what he saw in the world; and still does, sometimes. And a little way further down the trail were the views that we had hoped for. 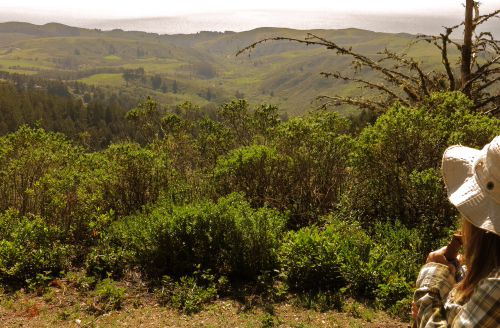 We looked out over an open slope, which was covered with Poison Oak in full bloom, down into the Lobitos Creek valley, out at the Pacific Ocean. Some kind of flower was sending its delightful perfume into the sun-warmed air around us; I’m pretty sure this perfume came from the Poison Oak; maybe Poison Oak is good for something after all. By the time we got back to the car, it was cloudy and cool, down to 52 degrees. 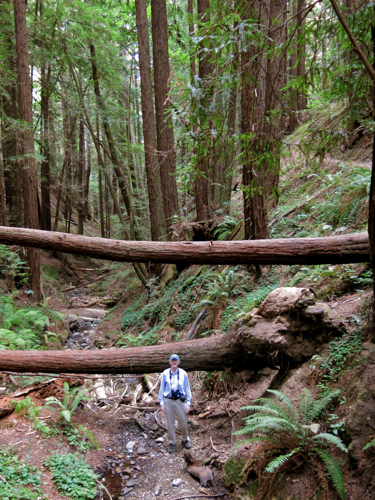 We had walked about 11.4 miles, with a total elevation gain of about 2,500 feet. We felt kind of tired. Standing in the creek bed of Purissima Creek, about two miles from Higgins Canyon Road.